I have been thinking of late what appropriate business dress for women is. There aren't a great many good examples to follow out there, except perhaps Hillary Clinton. 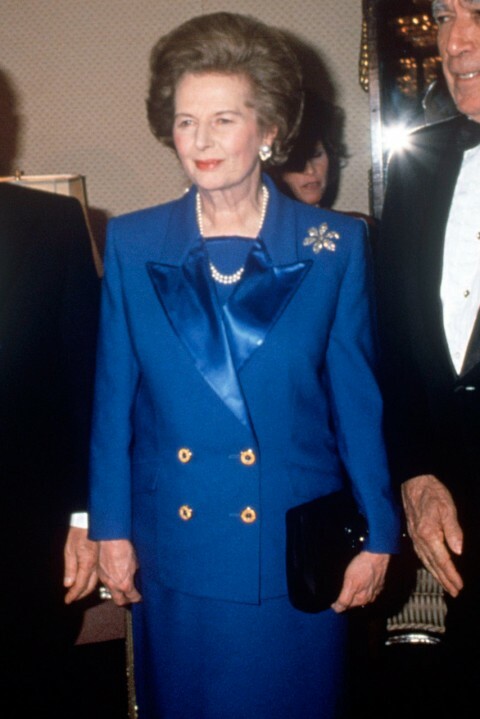 When you look at old pictures of Margaret Thatcher, irrespective of what you think of your politics, I am always impressed how little the clothes get in the way. I think it was Coco Chanel who said that if you are badly dressed people will notice your clothes and that if you are well dress people will notice the person. I look at Angela Merkel and cringe somewhat. Am I the only one to notice the clothes too much? Any thoughts on what elegant business dress is for women? I always look at Merkel’s jackets and find they are designed very good but with a bad fitting. She loves the colors to pretend not too lock to serious. I like for women stripe design, trousers with coat as business attire. Well, there is another lady in he german government: Ursula von der Leyen. She is very tough. Nothing like Merkel. Very elegant and very sharp. I agree with Zuschneider. 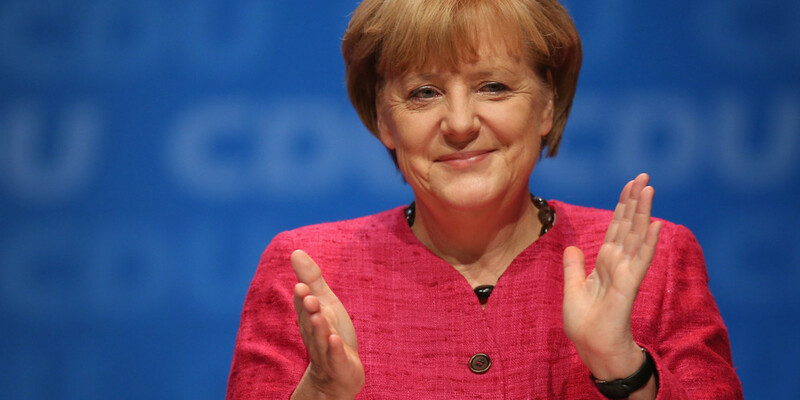 I think Merkel's jackets are very well done and I think well cut, too. I know that it is not easy for a person in such a position to "hold" her figure shape. It is a up and down. I met once a person who had sewed in a elastic part in the back and covered this always with a jacket, which was not buttoned at front. Your dress, sator, is well done and very interessing for tailors. All this cut and fit in the bias. I write nothing about the seperating seam at high hip and the large buttons . But for a business woman it is not versatile enough. Edited by posaune, 17 November 2013 - 05:06 AM. That is a rather flattering picture of our "Angie", and probably an older one. All those long meetings about how to save the banks made her put on some weight! Anyway, why would someone put in shoulder pads when a person has such straight shoulders? Her jackets are usually way to short and too high buttoned up. A one or two button jacket with a long lapel and a length to cover her hips would look better on her. A business wardrobe should be functional and basically sober when it comes to colour and cut, preferably with a good fit. Sadly, too many women try to follow the trend of wearing short jackets and low rise trousers, mostly cut way too tight. It's strange that especially the big girls prefer to wear skin tight clothes, is it a weird, unrealistic perception of themselves? As a basic wardrobe a costume (jacket and skirt) with an additional pair of trousers will do the trick when travelling, accompanied by a trench style overcoat. A dash of colour can be added with a blouse and matching accessories. It's indeed hard to find decent pictures, all I could find were those ill fitting, cheap examples sold at rather low prices. And about that dress: Nice try, but epic fail. 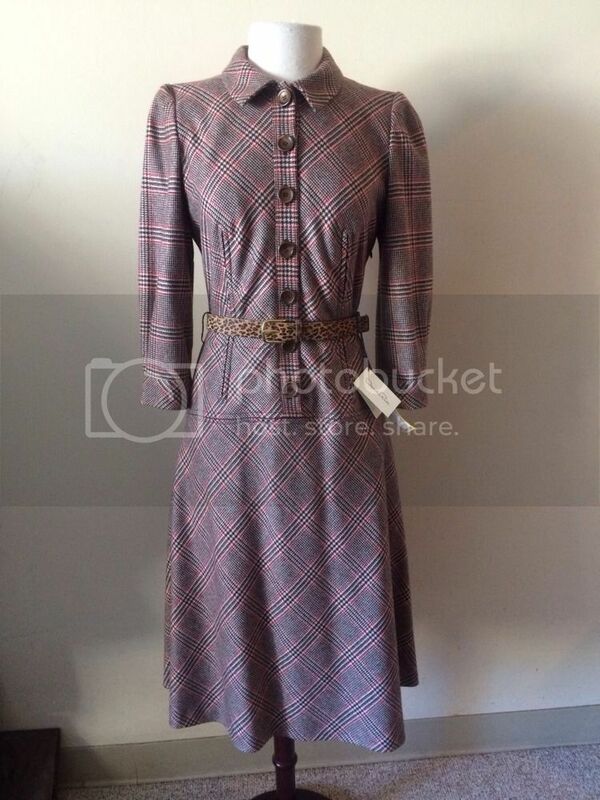 Check the pattern above the waist and at the collar and left sleeve. It's off by at least 1"! I've recommended Corporette in the past. I think those suits are great styles to emulate. I really like the ones by Albert Nipon and Nanette Lepore. The fabric has 2 different kind of stripes, that's way it looks so strange. The dress made with around 15oz fabric is good for Alaska. Hope you won't be offended but this is not to my taste. I personally don't like many plaids, and I really don't like the colors of this one. I find the fabric to be too conspicuous and too dowdy at the same time. I would prefer this much more as a suit, so one could pair the top or bottom with a solid black top or bottom. As someone else said, it's not very versatile. I don't understand the leopard skin belt either, even in these days of anything goes, it seems like too much, but I'm not a fan of animal prints. Edited by tailleuse, 18 November 2013 - 01:35 AM. These women's dresses by J. Crew are all pretty smart looking and most of could be worn to work with a jacket. For a business formal occasion,a formal dress is necessary and important.Otherwise,in your spare time you should wear casual clothes even can be matched with a medium black wig or a fashionable hair wig that fits for your face feature. Interests:If I ever have the time: tailoring, hunting, dogs and literature. I find the duchess of Cambridge to be rather well dressed in modern, and age appropriate, but slightly conservative coat dresses. She (or rather her stylist) often choses exclusive (and obviously very expensive) tailored garments, wich are unattainable for most people but offer some ideas for younger professional women. I think she looks great. Tasteful, polished, and appropriate. The clothes don't make her look prematurely old. I agree. I think she looks beautiful. Certainly clothing to look up to. She certainly is nicely dressed and and the outfits would probably be very expensive but it comes at the price that she must perform in public and be seen to look in a particular way and its probably more of a burden than a virtue. For people who must be seen as show ponies, the sheer luxury of slobbing around in a pair of track pants probably does not occur all that often. No one was suggesting that the Duchess of Cambridge was a typical businesswoman. I think that the worst thing to be said about the sorry state of women's business clothing (which quite frankly cannot even be purchased in my neck of the woods!) is the toll that substandard dress has on the careers of most women. Women simply fail to acknowledge that dressing like a cashier at the mall will not carry the same impact as a man in a business suit. They don't even realize that the trendy, flouncy polyester "top" they purchased at the "high end" store at the mall doesn't carry as much impact as the khakis and golf shirts most men wear daily in the American business place. Part of this is of course that many women are going to go without in order to benefit their children, but some of it is simply that society keeps telling them to dress "trendy" without mentioning to them - "and oh, by the way, that promotion is going to Jack simply because he just looks more professional, but we're certain you will continue to do his job for him (as we know he isn't as qualified) so that he can buy even more nice things to wear and so better represent our company." I have seen this SO many times. To me that is the saddest part of this entire dilemma. The sexism in our society plays out in other ways as well. A lot of young women simply won't accept that to be taken seriously they have to dress more seriously and that it's better to have a basic, stylish wardrobe than to follow every trend. But they don't take themselves seriously and aren't willing to make the sacrifices or compromises, including, some aspects of personal expression. It's hard to blame them at times when in nontraditional women's fields so much discrimination still exists. Edited by tailleuse, 20 June 2014 - 05:19 AM.